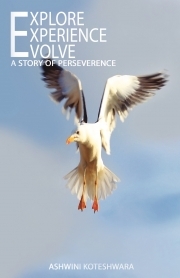 Description of "Explore Experience Evolve"
In this book, the budding Author takes you through a colorful journey of her life from a remote village in India to her current life in Germany and explains the power of continuous learning to achieve the greatness that one would not even have dreamed. She shares some of the life lessons that she received along the way, as a child, as a youngster and now as an adult, from inspiring people around and from her own experiences. The funny situations she landed in or went through because of her own beliefs and immaturity as a youngster and how her thoughts evolved over time. Introspection of how each experience and her response to them changed her life. How her quest of being interested in everything that this life had to offer and “continuous learning” has made her be happy and successful. She also shares the secret about how our own attitude towards life can make us feel positive or negative; older or younger. With full of real-life stories connecting different worlds, this book is an astounding, profound and powerful read that’s as beautiful as inspirational. Ashwini Koteshwara is a Computer Engineer by profession and a full-time hobbyist. She has a big list of hobbies like travelling & photography, sports forms like cycling, karate & Badminton, Musical instruments Piano, Violin & Drums and crafts like soap making, candle making, paper arts. "How can you do so many things? How do you find time for everything?" are the questions she often comes across from people around, for which her answer is mostly a humble smile. Born and raised in a remote village in India and travelling across continents exploring diverse cultures and pursuing different hobbies she has accumulated wealth of experience which is shared in this book. Reviews of "Explore Experience Evolve"